← Woo hoo! West Seattle Be Prepared has 600+ Facebook members ! As October wraps up, we wanted to remind you that the Seattle Office of Emergency Management’s free fall classes continue through November. Starting this weekend, November 1st & 2nd, you can learn how to store emergency drinking water or perform an earthquake retrofit on your home. 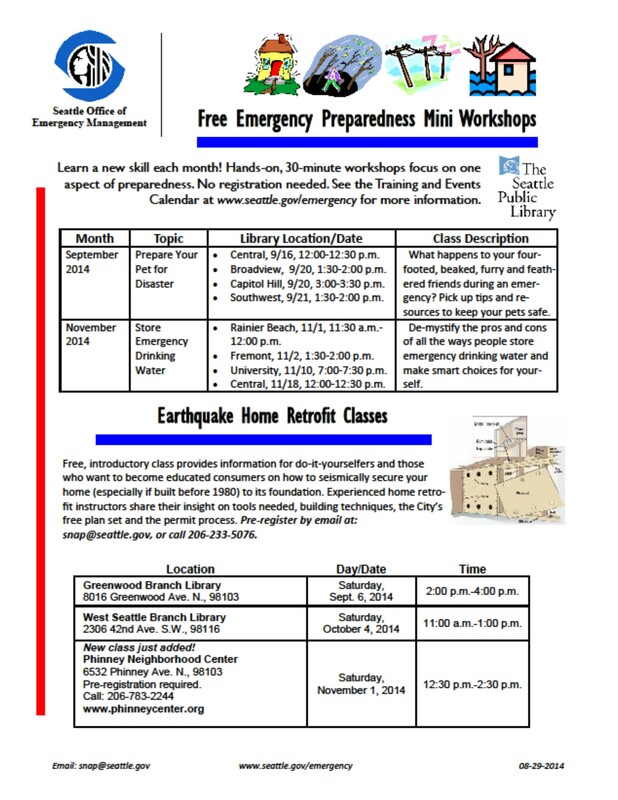 You can find the full schedule of emergency preparedness classes here. We’ve attached the informational flyer we received earlier this year below. This entry was posted in Announcements and tagged Seattle emergency preparedness, Seattle Office of Emergency Management, SNAP training. Bookmark the permalink.